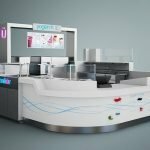 Are you looking for a unique red color concept cell phone repair kiosk stall in mall? 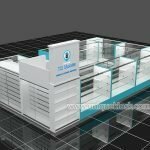 Here you go, one of the best cell phone display kiosk for mobile phone screen repair kiosk . Recently I met some French customers are looking for mobile phone repair kiosks. They asked if we did phone kiosks for French customers before. I immediately remembered Save. Save is a famous brand specialize in repairing mobile phones and selling phone accessories business. I told them we cooperated with Save, they are very surprised and happy. 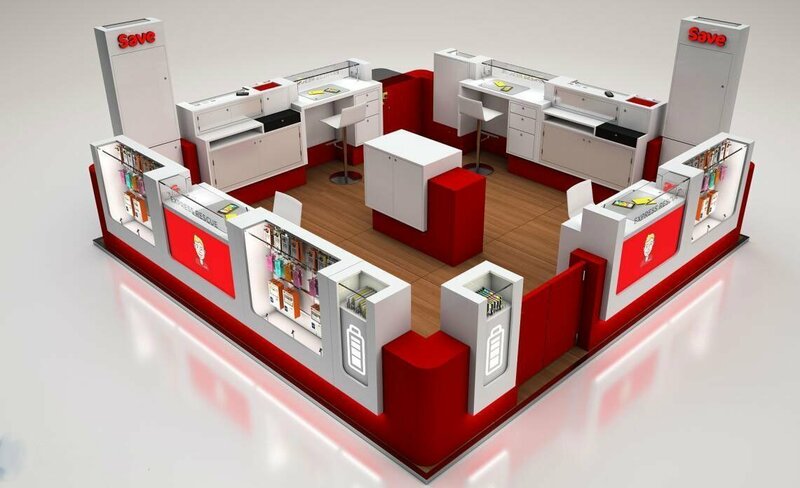 this mobile phone repair kiosk size is 4.5m by 4.5m. Totally used bright red match white, the whole kiosk looks very eye-catching. 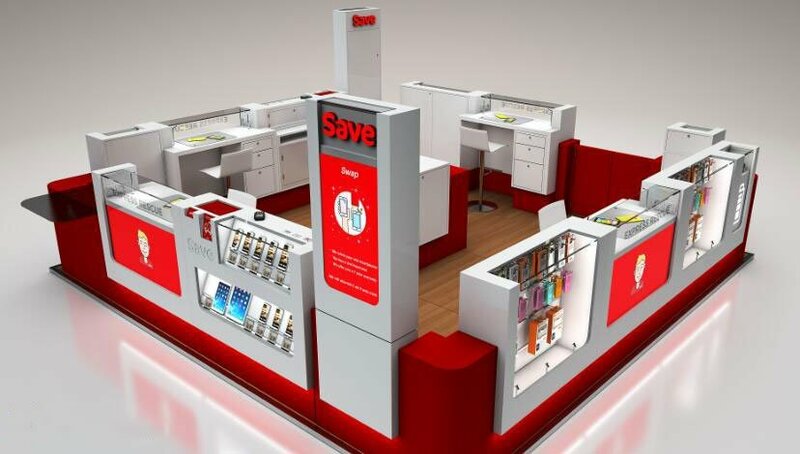 then let’s see this mobile phone repair kiosk in detail. 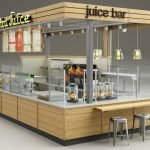 you will find this kiosk is very practical and functional. The four sides all have repair counters, so can do the repair on four sides, very convenient. Between the phone display and repair counter, you can see there has an area used to put the name card and brochure. If people are interested in getting more details they can pick up a name card and brochure. When they have needs, they can easily find you and contact you. This kind of design is very humane and clever, it helps promote sales a lot. And the phone accessories displays will need open from inside to put safety, French people safety consciousness is very strong. This way is safer than open from outside. and you can see it has a lower table for disable people, some disabled people will use a wheelchair, so the counter needs lower for them to take phones or accessories. 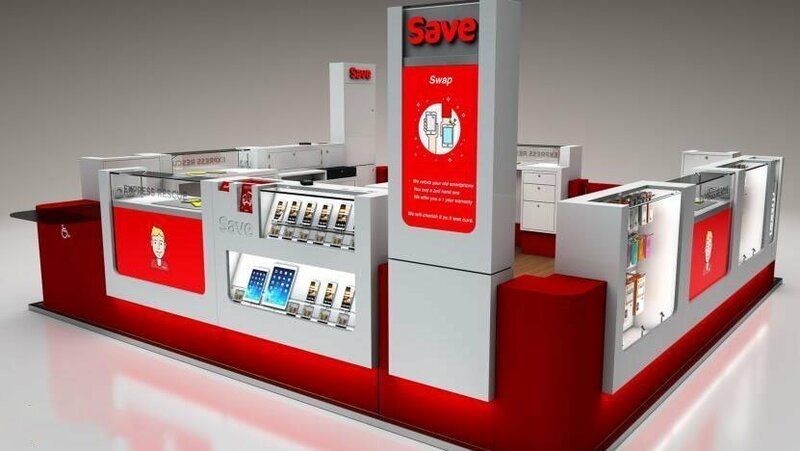 This Save mobile phone repair kiosk is a model for your reference.